Palo Alto Networks discovered a new family of iOS malware that successfully infected non-jailbroken devices. They’ve named it “AceDeceiver”. AceDeceiver is the first iOS malware they’ve seen that abuses certain design flaws in Apple’s DRM protection mechanism — namely FairPlay — to install malicious apps on iOS devices regardless of whether they are jailbroken. This technique is called “FairPlay Man-In-The-Middle (MITM)” and has been used since 2013 to spread pirated iOS apps, but this is the first time they’ve seen it used to spread malware. Note : The FairPlay MITM attack technique was also presented at the USENIX Security Symposium in 2014; however, attacks using this technique are still occurring successfully. Three different iOS apps in the AceDeceiver family were uploaded to the official App Store between July 2015 and February 2016, and all of them claimed to be wallpaper apps. These apps successfully bypassed Apple’s code review at least seven times (including the first time each was uploaded and then four rounds of code updates, which require an additional review by Apple for each instance) using a method similar to that used by ZergHelper, where the app tailors its behavior based on the physical geographic region in which it’s being executed. In this case, AceDeceiver only displays malicious behaviors when a user is located in China, but that would be easy for the attacker to change in any time. Apple removed these three apps from the App Store after we reported them in late February 2016. However, the attack is still viable because the FairPlay MITM attack only requires these apps to have been available in the App Store once. As long as an attacker could get a copy of authorization from Apple, the attack doesn’t require current App Store availability to spread those apps. 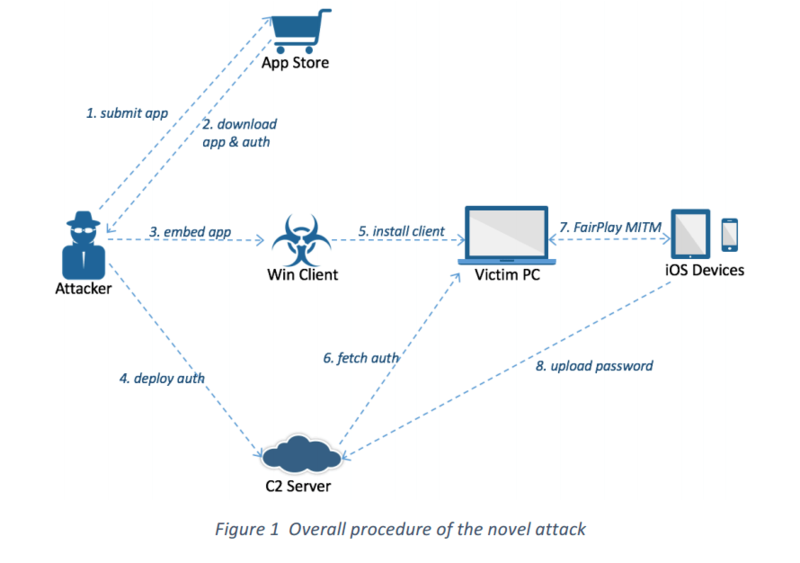 To carry out the attack, the author created a Windows client called ”爱思助手 (Aisi Helper)” to perform the FairPlay MITM attack. Aisi Helper purports to be software that provides services for iOS devices such as system re-installation, jailbreaking, system backup, device management and system cleaning. But what it’s also doing is surreptitiously installing the malicious apps on any iOS device that is connected to the PC on which Aisi Helper is installed. (Of note, only the most recent app is installed on the iOS device(s) at the time of infection, not all three at the same time.) These malicious iOS apps provide a connection to a third party app store controlled by the author for user to download iOS apps or games. It encourages users to input their Apple IDs and passwords for more features, and provided these credentials will be uploaded to AceDeceiver’s C2 server after being encrypted. We also identified some earlier versions of AceDeceiver that had enterprise certificates dated March 2015.